Warp of 8/2 cotton is tied on in 1-inch/2.5 cm sections. 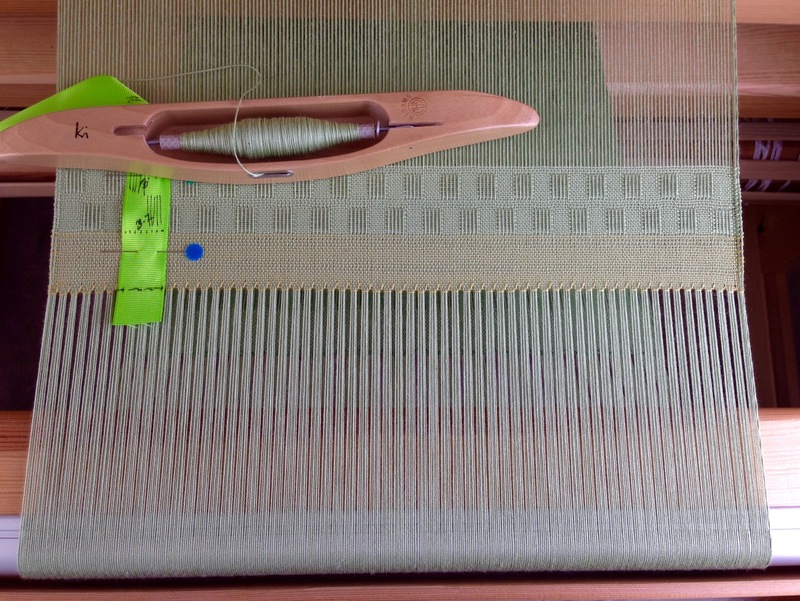 The leveling string evens out the warp for immediate weaving. 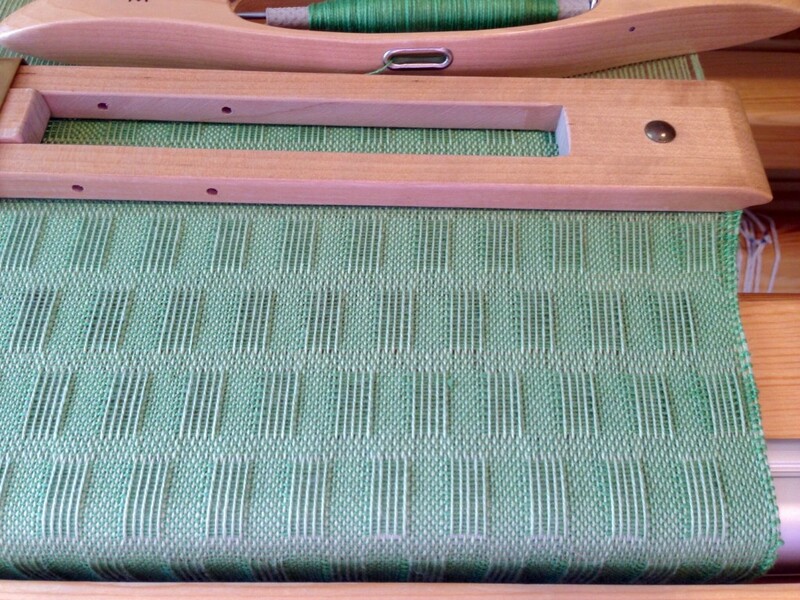 First scarf, with dark green weft, has the longest warp floats. This scarf ended up shorter than the second scarf, even though the first scarf’s length on the loom was longer than the second scarf. Second scarf, with citrine weft, has a border element created with light green weft (same as the warp), including warp floats. The plain weave before and after the border element helps create a natural ruffle at each end of the finished scarf. Saving the best for last, I used a series of springtime colors to create this scarf. The varied lengths of the floats give an illusion of colored ribbons crossing the scarf. 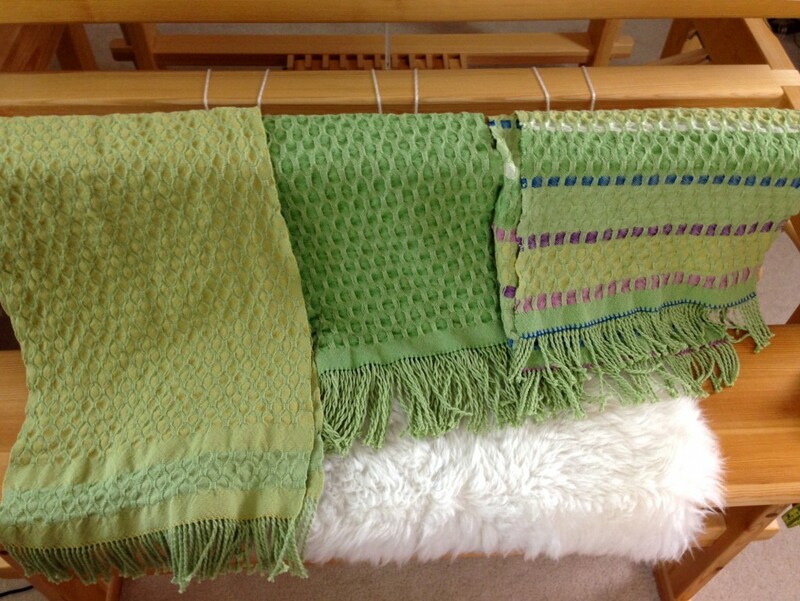 I wet finished the scarves in the washing machine, adding a small amount of Eucalan, on the gentle cycle, with warm wash and warm rinse, and very short spin. They went in the dryer on low heat until damp, and then hung to dry the rest of the way. The scarves came out lightly puckered, which is exactly what I had hoped for. I could have washed them in hot water and left them in for a longer amount of time if I had wanted the scarves more dramatically puckered. Two scarves with fringes twisted. One waiting to be a film star in “Using a Fringe Twister.” This is before wet finishing. Wet finishing happens after the fringe has been twisted. These scarves have done it all. They are finished. There’s nothing like finishing a fun project! 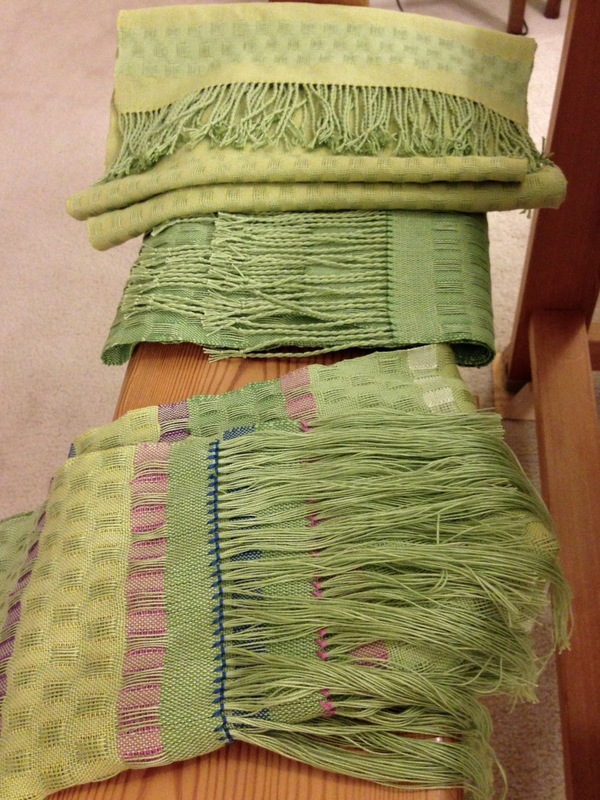 Clearly, I know what to do next… Dress the big loom and keeping on weaving. May you learn something new every day. I love your videos Karen and learn so much from them. Thank you! Thank you! Thank you for making the video. My fringe is going to look lots better next time I make it because of some of your ideas. Oh good! I am so happy you found the video helpful! I’m grateful you took the time to watch. Terrific video! I learned fringe twisting a different way, without the first set of knots, and I’ve never been completely happy with the consistency. Thanks for showing me another option. 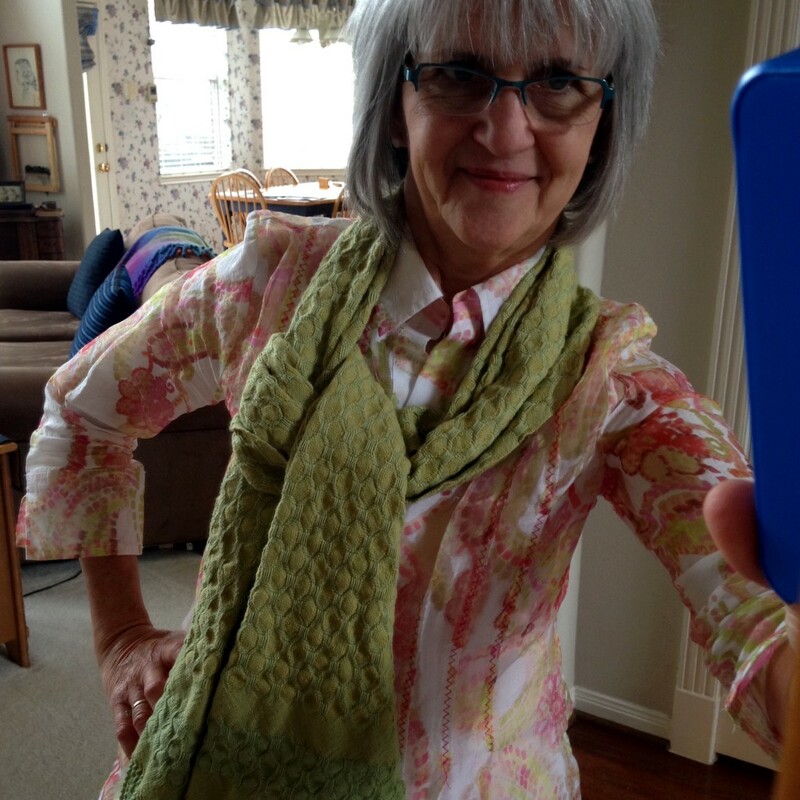 Beautiful scarves Karen! It’s nice to see how you do your fringe, I still need to learn so much and every little hint helps. Thank you! That’s the beauty of handcraft skills. There are multiple ways to produce desired results. I am not an expert, but I take a little of this, and a little of that, and eventually work out “my own” way. Truthfully, though, almost every little bit is something I have learned from a teacher or a book. Plus, a few things I learned the hard way through my own mistakes and mishaps. I’m glad to help you build up a repertoire of ways to do something, so you can get results you like. Thank you! I’m so glad you are here. Well Karen, as I have said your videos are really helpful. I have tried to use the twisters but did not knot my ends and of course they would slip off the fringe as I was twisting. Then I would get frustrated and go back to doing it by hand. Of course this killed my hands! So while I thought of knotting the ends I was too lazy (shame on me! ), but now I know I should. 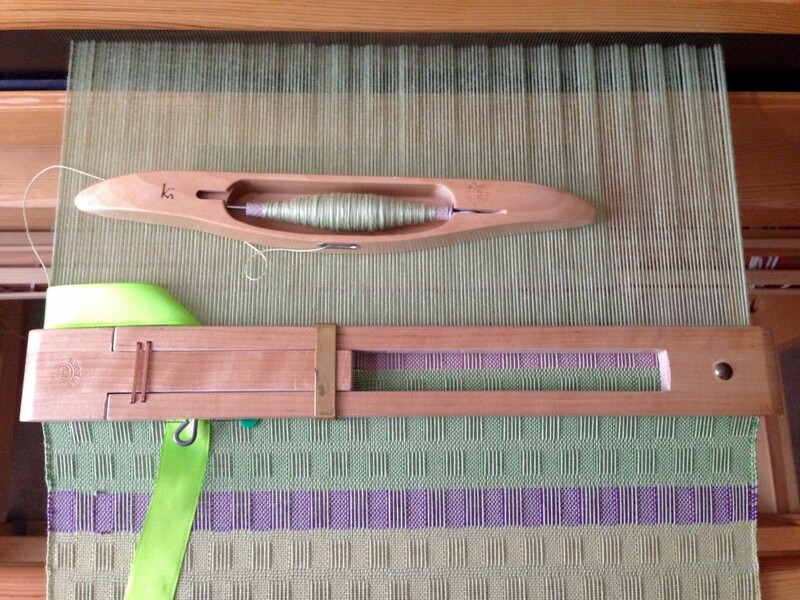 Also, I can’t wait to try twisting the fringe on the loom as you showed in your previous video. Always wondered how this task was accomplished! Thanks again! And oh, your work is beautiful! Dear Chris, it makes me so happy that you find the videos helpful! Steve and I are having fun making them, so your comment is icing on the cake! 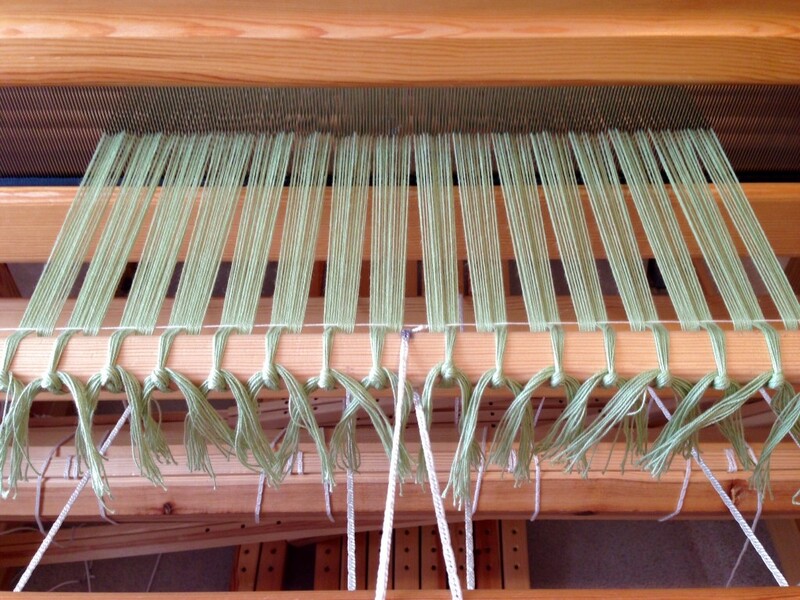 When you do twist some fringe on the loom, let me know how it turns out.